Im Rahmen unserer Serie zum städtischen Wärmeinseleffekt schauen wir heute über den Teich nach Amerika. Bereits im Jahr 1996 erschien im Bulletin of the American Meteorological Society eine Abbildung von Goodridge, die die Erwärmung des 20. Jahrhunderts ab 1910 in verschiedenen Regionen Kaliforniens unterschieden nach Einwohnerzahl zeigt (Abbildung 1). Interessanterweise weisen die bevölkerungsreichsten Regionen die stärkste Erwärmung auf. Abbildung 1: Erwärmung des 20. Jahrhunderts ab 1910 in verschiedenen Regionen Kaliforniens unterschieden nach Einwohnerzahl. Quelle: Goodridge 1996. Das Petition Projekt zeigt eine ähnliche Graphik aus Kalifornien für die Zeit von 1940-1996 (Abbildung 2). 57 cities had measurable urban heat island effects over the past 10 years. Single-day urban temperatures in some metro areas were as much as 27°F higher than the surrounding rural areas, and on average across all 60 cities, the maximum single-day temperature difference was 17.5°F. Cities have many more searing hot days each year. Since 2004, 12 cities averaged at least 20 more days a year above 90°F than nearby rural areas. The 60 cities analyzed averaged at least 8 more days over 90°F each summer compared to adjacent rural areas. More heat can increase ozone air pollution. All 51 cities with adequate data showed a statistically significant correlation between higher daily summer temperatures and bad air quality (as measured by ground-level ozone concentrations). Temperatures are being forced higher by increasing urbanization and manmade global warming, which could undermine the hard-won improvements in air quality and public health made over the past few decades. In two thirds of the cities analyzed (41 of 60), urbanization and climate change appear to be combining to increase summer heat faster than climate change alone is raising regional temperatures. In three quarters (45 of 60) of cities examined, urbanized areas are warming faster than adjacent rural locations. On average across all 60 cities, urban summer temperatures were 2.4°F hotter than rural temperatures. Urban heat islands are even more intense at night. Over the past 10 years, average summer overnight temperatures were more than 4°F hotter in cities than surrounding rural areas. Das Rezept gegen die Hitze: Mehr Bäume pflanzen! Im April 2012 gab es dann die Pointe: Terra Daily berichtete über einen andere Studie, die fand, dass die Bäume gerade aufgrund der Wärmeinsel in der Innenstadt New Yorks besser wachsen als im ländlichen Umland. City streets can be mean, but somewhere near Brooklyn, a tree grows far better than its country cousins, due to chronically elevated city heat levels, says a new study. The study, just published in the journal Tree Physiology, shows that common native red oak seedlings grow as much as eight times faster in New York’s Central Park than in more rural, cooler settings in the Hudson Valley and Catskill Mountains. US-Studie bescheinigt der eigentlich sauberen Windenergie temperatursteigernde Eigenschaften. Windparks sind die Hoffnungsträger im Kampf gegen den Klimawandel. Und nun das: Amerikanische Forscher haben in einer Gegend mit über 2000 Windkraftanlagen innerhalb eines Jahrzehnts eine Erwärmung von 0,72 Grad gemessen. Die Zahl klingt dramatisch, ist aber mit Vorsicht zu interpretieren. “Diese Zahl bezieht sich nur auf die untersuchte Region und Zeitspanne. Andernfalls könnte sie missverstanden werden. Die Leute könnten denken: Oh, was ist denn dann in 100 Jahren? Dann wäre der Temperaturanstieg ja stärker als die globale Erwärmung.” Sieben Grad Erwärmung in 100 Jahren? Es sind Schlagzeilen wie diese, die Liming Zhou befürchtet. Denn die Zahl, die er mit Kollegen aus seinen Messungen errechnet hat, bezieht sich auf ein spezielles, 10.000 Quadratkilometer großes Gebiet in Texas: Zum Startpunkt der Untersuchung 2003 standen dort gerade einmal 111 Windkraftanlagen, am Ende, 2011, waren es 2358. Die gemessene Erwärmung spiegelt also vor allem das Wachstum des Windparks wider und wird in den kommenden Jahrzehnten vermutlich stagnieren, meint der Atmosphären-Forscher. Dass vor allem große Windparks, wie sie etwa in Texas gebaut werden, die Temperaturen vor Ort beeinflussen, ist mittlerweile aber weitestgehend unumstritten. The wind industry in the United States has experienced a remarkably rapid expansion of capacity in recent years and this fast growth is expected to continue in the future. While converting wind’s kinetic energy into electricity, wind turbines modify surface–atmosphere exchanges and the transfer of energy, momentum, mass and moisture within the atmosphere. These changes, if spatially large enough, may have noticeable impacts on local to regional weather and climate. Here we present observational evidence for such impacts based on analyses of satellite data for the period of 2003–2011 over a region in west-central Texas, where four of the world’s largest wind farms are located. Our results show a significant warming trend of up to 0.72 °C per decade, particularly at night-time, over wind farms relative to nearby non-wind-farm regions. We attribute this warming primarily to wind farms as its spatial pattern and magnitude couples very well with the geographic distribution of wind turbines. Insbesondere in der Nacht liegt die Temperatur in der Nähe von Windparksdeutlich über denen der weiteren Umgebung. Die Ursache dafür ist die Turbulenz, die durch die Windräder erzeugt wird. Dadurch wird die Atmosphäre durchmischt, so dass die Bildung einer bodennahenInversionsschicht erschwert wird. Eine solche Inversionsschicht sorgt normalerweise in der Nacht für deutlich zurückgehende Temperaturen. The rapid development of wind energy has raised concerns about environmental impacts. Temperature changes are found in the vicinity of wind farms and previous simulations have suggested that large-scale wind farms could alter regional climate. However, assessments of the effects of realistic wind power development scenarios at the scale of a continent are missing. Here we simulate the impacts of current and near-future wind energy production according to European Union energy and climate policies. We use a regional climate model describing the interactions between turbines and the atmosphere, and find limited impacts. A statistically significant signal is only found in winter, with changes within ±0.3 °C and within 0–5% for precipitation. It results from the combination of local wind farm effects and changes due to a weak, but robust, anticyclonic-induced circulation over Europe. However, the impacts remain much weaker than the natural climate interannual variability and changes expected from greenhouse gas emissions. Growth of the surface temperature urban heat island (UHI) of Houston, TX is determined by comparing two sets of heat island measurements taken 12 years apart. Individual heat island characteristics are calculated from radiative temperature maps obtained using the split-window infrared channels of the Advanced Very High Resolution Radiometer (AVHRR) on board National Oceanic and Atmospheric Administration polar-orbiting satellites. Eighty-two nighttime scenes taken between 1985 and 1987 are compared to 125 nighttime scenes taken between 1999 and 2001. Analysis of the UHI characteristics from these two intervals reveals a mean growth in magnitude of 0.8 K, or 35%. The growth of the mean area of the UHI is found to range between 170 and 650 km2, or from 38% to 88%, depending on the method of analysis. Using climatic data from Fairbanks and rurally situated Eielson Air Force Base in Interior Alaska, the growth of the Fairbanks heat island was studied for the time period 1949 – 1997. The climate records were examined to distinguish between a general warming trend and the changes due to an increasing heat island effect. Over the 49-year period, the population of Fairbanks grew by more than 500%, while the population of Eielson remained relatively constant. The mean annual heat island observed at the Fairbanks International Airport grew by 0.4 °C, with the winter months experiencing a more significant increase of 1.0 °C. Primary focus was directed toward long-term heat island characterization based on season, wind speed, cloud cover, and time of day. In all cases, the minima temperatures were affected more than maxima and periods of calm or low wind speeds, clear winter sky conditions, and nighttime exhibited the largest heat island effects. The village of Barrow, Alaska, is the northernmost settlement in the USA and the largest native community in the Arctic. The population has grown from about 300 residents in 1900 to more than 4600 in 2000. In recent decades, a general increase of mean annual and mean winter air temperature has been recorded near the centre of the village, and a concurrent trend of progressively earlier snowmelt in the village has been documented. Satellite observations and data from a nearby climate observatory indicate a corresponding but much weaker snowmelt trend in the surrounding regions of relatively undisturbed tundra. Because the region is underlain by ice-rich permafrost, there is concern that early snowmelt will increase the thickness of the thawed layer in summer and threaten the structural stability of roads, buildings, and pipelines. Here, we demonstrate the existence of a strong urban heat island (UHI) during winter. Data loggers (54) were installed in the ∼150 km2 study area to monitor hourly air and soil temperature, and daily spatial averages were calculated using the six or seven warmest and coldest sites. During winter (December 2001–March 2002), the urban area averaged 2.2 °C warmer than the hinterland. The strength of the UHI increased as the wind velocity decreased, reaching an average value of 3.2 °C under calm (<2 m s−1) conditions and maximum single-day magnitude of 6 °C. UHI magnitude generally increased with decreasing air temperature in winter, reflecting the input of anthropogenic heat to maintain interior building temperatures. On a daily basis, the UHI reached its peak intensity in the late evening and early morning. There was a strong positive relation between monthly UHI magnitude and natural gas production/use. Integrated over the period September–May, there was a 9% reduction in accumulated freezing degree days in the urban area. The evidence suggests that urbanization has contributed to early snowmelt in the village. The linear change in temperature between 1920 and 1984 is calculated for 961 stations in the conterminous United States. Annual, winter, and summer maps of these temperature changes reveal pronounced geographical patterns, with widespread cooling in the major south-central portion of the United States and general warming in the northeast and west. 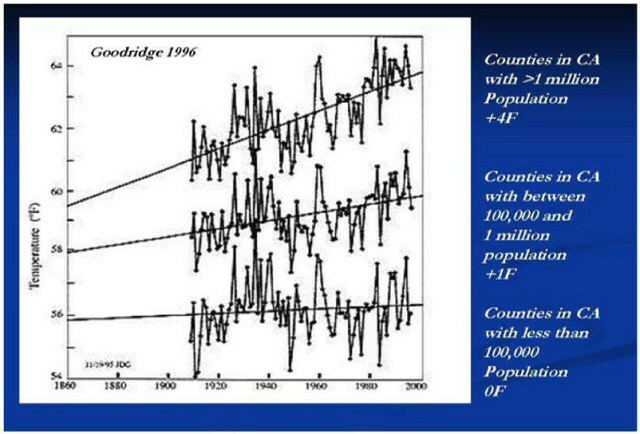 Stepwise multiple regression analysis identifies a statistically significant impact of population change on these temperature trends, even though the stations utilized in this study had a median population of only 5832 in 1980. Both the observed mean annual cooling of the country and the warming bias provided by these small urban centers suggest that we may not yet have a proper perspective on global climatic change. Teil 1: Der Elefant im Raum: Ist der Städtische Wärmeinsel-Effekt vernachlässigbar? Teil 6: Städtischer Wärmeinseleffekt: Blick nach Asien. Eine faustdicke Überraschung!